Today on History Undressed, I'd like to introduce you to a new guest author, Alethea Williams! Ms. Williams is taking us back to the 1950's. Thanks for being here with us today! From the series “Southwest Wyoming: A Tough Place to Live,” a new feature on www.actuallyalethea.blogspot.com. I didn’t want to go down in that hole. I wanted to see the sunshine. Fresh out of high school in Superior, Wyoming in the spring of 1950, C.D. 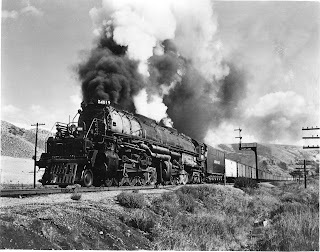 “Don” Englert had the choice of joining the Union Pacific Railroad or the coal mine. He picked the railroad, starting on the extra gang at Thayer Junction where the Superior road joined Highway 30. The extra gang was a labor intensive crew of 180 men that comprised three gangs in one. The first gang raised the track, the second put in the ties, and the third ballasted and tamped. locomotive #4019 and string of PFE cars in Echo Canyon, Utah. First of this type locomotive built in 1941 for freight service. While other U.P. divisions were rapidly converting to diesel engines, the Wyoming Division continued to run the huge black steam engines called Big Boys in order to best utilize the company’s coal. Men hitched rides to work on Monday on milk trains, local trains that hauled the mail and were willing to stop anywhere free of cost to company employees. During the week, maintenance-of-way workers lived in outfit cars, 10 or more men in each boxcar converted with windows, a door, a stove and bunks lining the walls. One or two men in the bunk car kept coal and water buckets filled. Breakfast and dinner were served in the commissary car, but chow lines formed at the work site for lunches of huge 20-gallon “hot pots” of soup with sandwiches. While the crew was working, one man was designated the water boy. With his wooden barrels, a bucket and a dipper, he would start with the head man and come down through the line offering each a drink from the dipper. Unable to completely fill the ranks for the grueling summer work, the railroad recruited on the skid rows of 25th Street in Ogden, Utah; Larimer Street in Denver; and in Cheyenne. Don recalls with amusement that the “winos” worked only until they got their paychecks of $1.12 an hour and that today there would be few who would be willing to share living quarters or the same water dipper with them. With grades and curves the enemies of railroad efficiency and heavy Big Boys hammering the rail, there was still work for an ambitious young man after the extra gang was disbanded for the winter. Don took a job as a section man, married and lived with his bride in a two-room boxcar with no running water. He passed the foreman’s exam in 1952, working the Wyoming Division between Ogden and Cheyenne relieving other foremen for vacations. Promoted again to rail inspector, Don rode a little motorcar with no windshield, looking for broken rail, bad ties and deep holes in the track. Before the days of insulated coveralls, a rail inspector wore layers of clothing to ward off the bitter cold and wrapped his feet in a piece of sheepskin. Putt-putting down the track against the Wyoming wind, it often took much longer than eight hours to cover the 30 miles a day, stopping to inspect all the switches and look for loose bolts. When he came up on a curve, he set the 500-pound motorcar off by its handles and inspected the curve on foot with a magnifying Sands mirror, looking under the rail for cracks, head and web separation and broken rail. The lineup was put out morning and noon to alert workers on the track to train schedules. 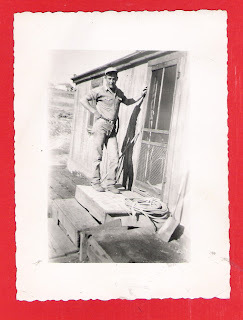 Every two hours, Don would stop at a telephone situated at passing tracks or use a field phone with a long pole that connected to the telegraph lines to call the dispatcher. Wiley Shaver was the dispatcher in Green River and if he gave a time on a train, “you better believe it” according to Don. Or a brave man could just “look for the smoke” of the steam engines; not an option with the coming of the diesels! Telegraph poles no longer line the track. The coal chutes are gone. But those who worked the rails remember when the Big Boys passed and men stood with shirt collars clutched and eyes closed against flying cinders as the boiler worked uphill. Still yet at Creston Hill, Tipton Hill and in to Rock Springs, the carbon residue from steam engines drifts deep in the ditches alongside welded tracks built mainly now with machines instead of manpower. The author would like to thank Eliza Knight for the opportunity to guest blog on History Undressed. 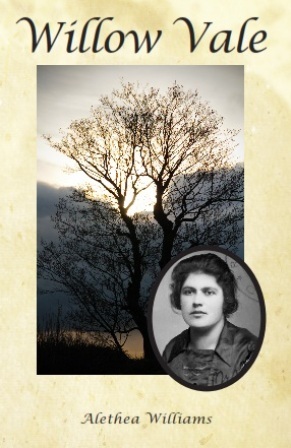 Alethea Williams has recently released the historical novel, Willow Vale. You can read more about the book and its southwest Wyoming origins, as well as Alethea’s journey as a writer, on her blog at http://actuallyalethea.blogspot.com/. I'm a railfan, and had the pleasure of seeing a Big Boy on display. What an enormously powerful piece of machinery!